A Venezuelan refugee rests at the Rumichacha International Bridge, the main point of entry into Ecuador via Colombia. In November 2018, some 2,500 Venezuelans were entering the country daily through this border. UN human rights chief Michelle Bachelet warned on Friday that the situation in Venezuela could “rapidly spiral out of control”, amid ongoing deadly violence and uncertainty linked to Wednesday’s declaration by Juan Guaidó that he had become the country’s interim president. 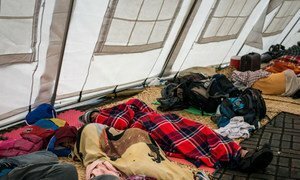 At the same time, the UN refugee agency (UNCHR) warned of “mounting tension” in the troubled country as some 5,000 people a day continue to leave, a “significant number” of them in “dire” need of protection. Well over 350 people have also been detained in the recent protests, including 320 on 23 January alone, said the UN rights office, while staff have also reported raids on property in some of the poorest areas of Caracas where at least 180 protests have taken place this week. In her statement, Ms Bachelet insisted that it was vital to prevent a repetition of repression against protesters of the Government of President Nicolás Maduro, who was officially sworn back into office, just two weeks ago. Grave rights abuses documented by OHCHR in 2017 included extrajudicial killings, widespread arbitrary detentions, restrictions to freedom of assembly and expression and indiscriminate house raids and attacks. Mr Colville noted the High Commissioner’s appeal to the Venezuelan authorities to exercise restraint, especially the security forces. They should also respect everyone’s fundamental right to peaceful assembly and freedom of expression, he continued, adding that the UN rights chief wished to remind them that the “excessive, disproportionate or indiscriminate use of force is clearly and unequivocally prohibited under international law”. Echoing comments by UN chief António Guterres on Thursday that everything must be done to avoid the kind of conflict “that would be a total disaster for Venezuela, for the Venezuelan people and for the region”, Ms. Bachelet urged the country’s political leaders to begin “immediate” talks to defuse the situation and find a practical long-term solution to the country’s entrenched social, political and economic crisis. “She says it’s vital the authorities refrain from closing any remaining avenue of dialogue by prosecuting political and social leaders including members of the National Assembly,” Mr Colville said, in reference to the opposition-controlled chamber, which is led by Juan Guaidó, whose declaration assuming the interim-presidency has also sparked a diplomatic crisis, with some countries in the region, including the US, backing him, while others, including Russia and Cuba, have defended President Maduro. At the Venezuelan border, meanwhile, UNHCR said that thousands of people continue to leave the country, amid the ongoing economic and security crisis. More than three million have done so in recent years. 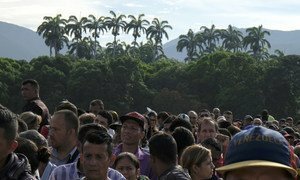 “The population movement so far has remained constant since last year, and that is some 5,000 Venezuelans leaving their country every day on average,” Spokesperson Liz Throssell said. Commenting on the situation of those travelling outside Venezuela to neighbouring countries, the UNHCR spokesperson noted that “we have seen a significant number in dire need of international refugee protection and humanitarian assistance. Reports of violence and casualties linked to unrest in Venezuela should be investigated transparently and independently, UN Secretary-General Antonio Guterres said on Thursday, before calling for calm.